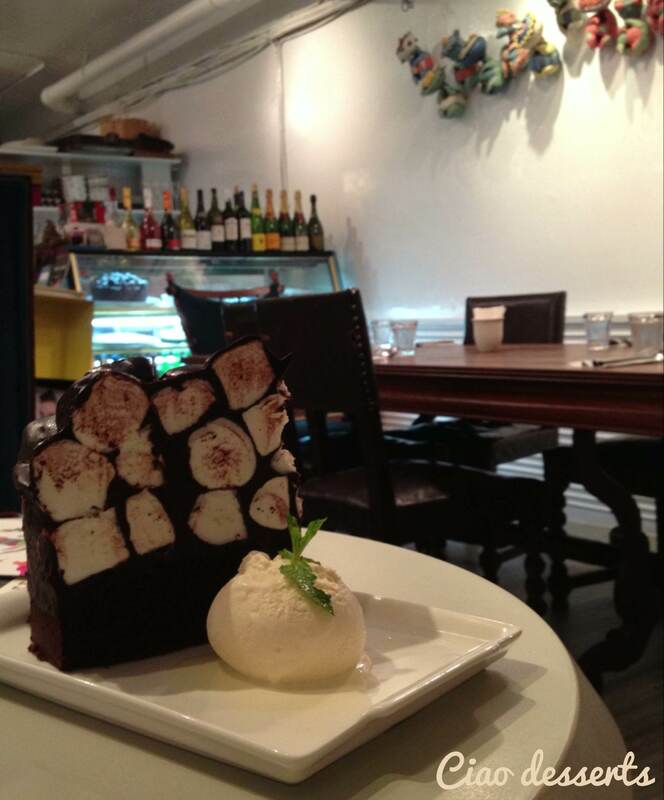 I stopped into VVG Bistro for a coffee break the other day, and tried their chocolate marshmallow cake. When it arrived at the table, I was what my friend Ridhi once said “of two minds.” One mind gleefully thought “Holy moly, what a *huge* slice of cake!” The other mind asked “huh? It’s just a piece of cake on a plate?” Remember it’s the VVG restaurants! The presentation is supposed to be awe-inspiring! But, since there was a delicious aroma of chocolate and a melting scoop of vanilla ice cream just calling for my attention, I gathered my wits and concentrated on the task at hand. First of all, how to navigate this piece of cake was a bit of a challenge. Do I just rudely knock it over and cut it into pieces? Or do I try to delicately excavate it vertically? I tried the second option just to see what would happen and the cake just toppled over. Glad that challenge was out of the way. My first bite was a mixture of chocolate ganache and marshmallow. Yum. The ganache was thick, yet still melt in your mouth, and the marshmallows were simultaneously airy and chewy. 巧克力＋棉花糖蛋糕解剖圖However, I was a bit disappointed to discover that the cake was dry and crumbly. The first word that came to mind was “sturdy.” Good thing there was a generous scoop of vanilla ice cream on the side, which helped balance out the dryness of the cake. But as I ate the cake, I gradually realized that the cake had to be “sturdy” in order to support that towering pile of marshmallows and ganache. So, in short, cake texture had to be sacrificed for the structural integrity of the slice. As I sat toying with the last few bites, I thought this chocolate marshmallow cake could be reinterpreted into a dessert that was less overwhelming, and more transportable, so I could easily package it and share with others. 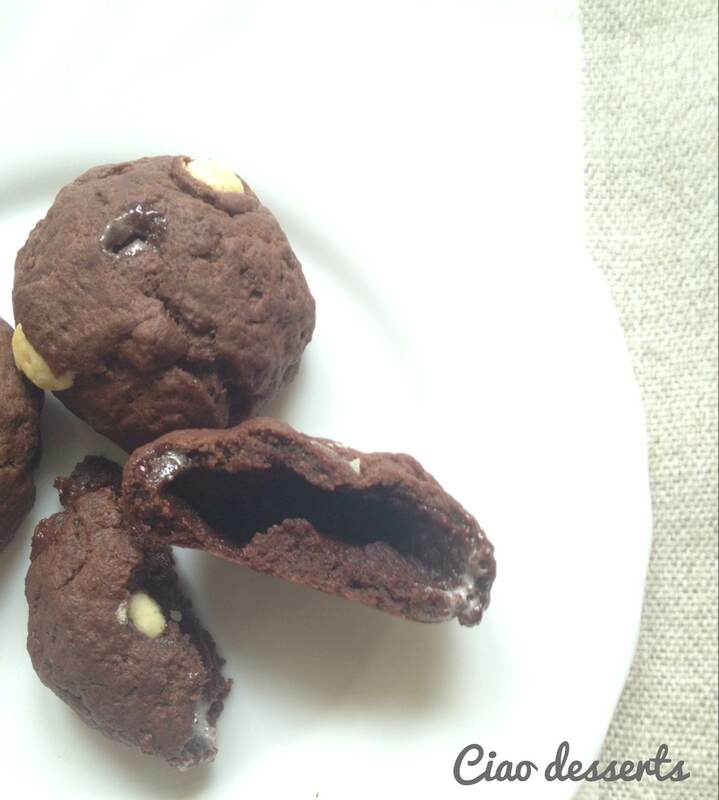 I vaguely remembered making some combination of chocolate and marshmallow cookies sometime in high school, and after a quick online search I found the original Mrs Field’s recipe. Note: We don’t have miniature marshmallows in Taiwan, so I just bought the regular sized ones and chopped them into fourths before putting them into the freezer. I reduced the amount of both sugars to just 1/3 cup each , because I thought combined with the chocolate chips and the marshmallows, it would be sweetness overload. Notes: When I got to Step 10, I was met with this sandy, gritty mess in my mixing bowl. My handheld mixer sputtered and groaned and refused to continue. I squelched my feelings of doubt by attacking the mixture by hand and pretty soon it all came together, and turned into a workable cookie dough. 到了這個階段 (第10) 的時候 餅乾會變成一個看起來很沒有絕望的一堆粉末，但是 不要放棄！ 在攪拌一下就可以了。Preheat oven to 400 degrees. Until you are ready to assemble the cookies just prior to baking, keep the marshmallows in the freezer- otherwise they will thaw too rapidly. 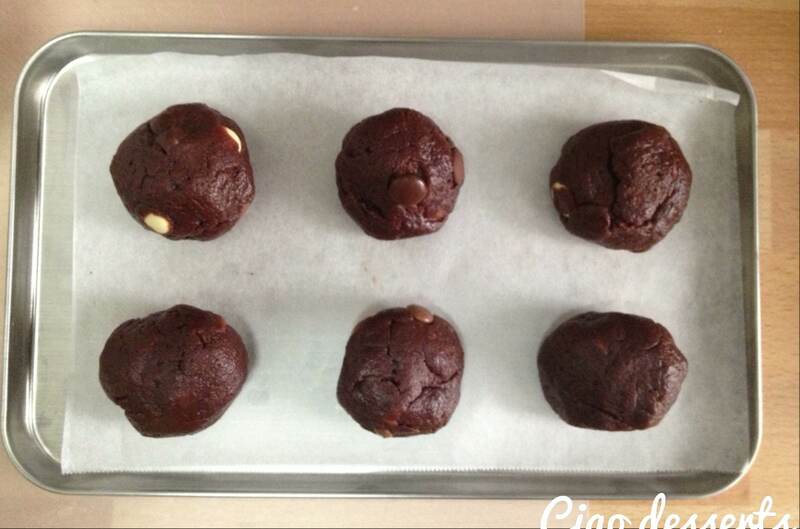 Place the marshmallows back into the freezer between each batch of cookies. 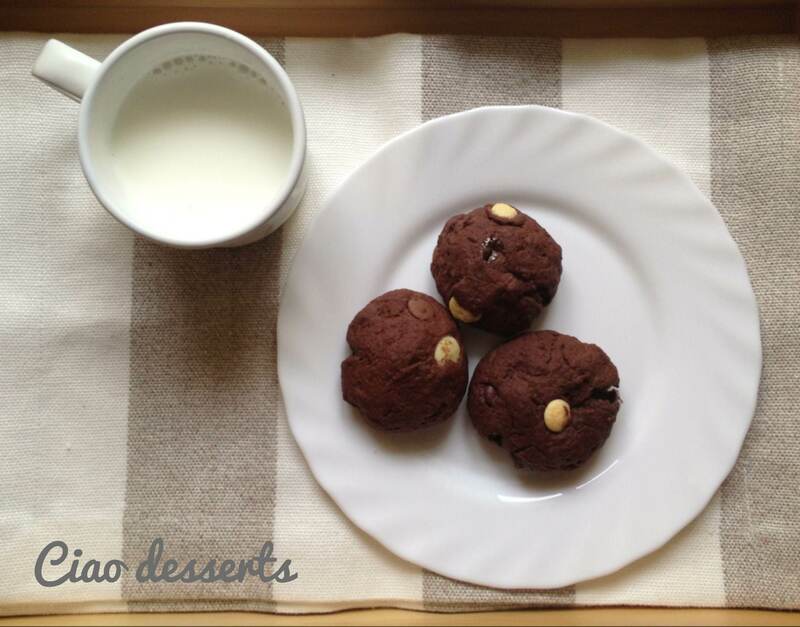 In a medium bowl combine flour, cocoa and baking soda. Combine sugars in a large bowl. Using an electric mixer, blend in butter, scraping down the sides of the bowl. Add eggs and vanilla, and beat at medium speed until light and fluffy. 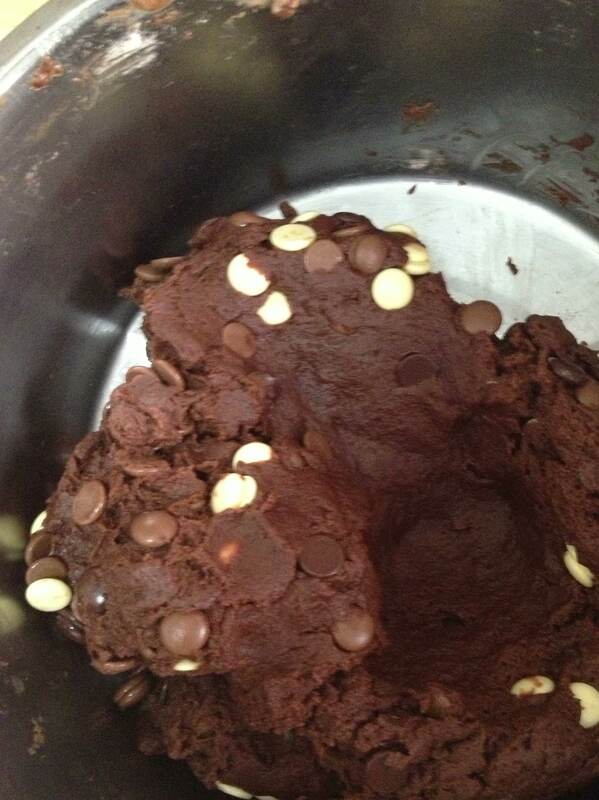 Add the flour mixture and chocolate chips, and blend at a low speed until combined. Batter will be very stiff. 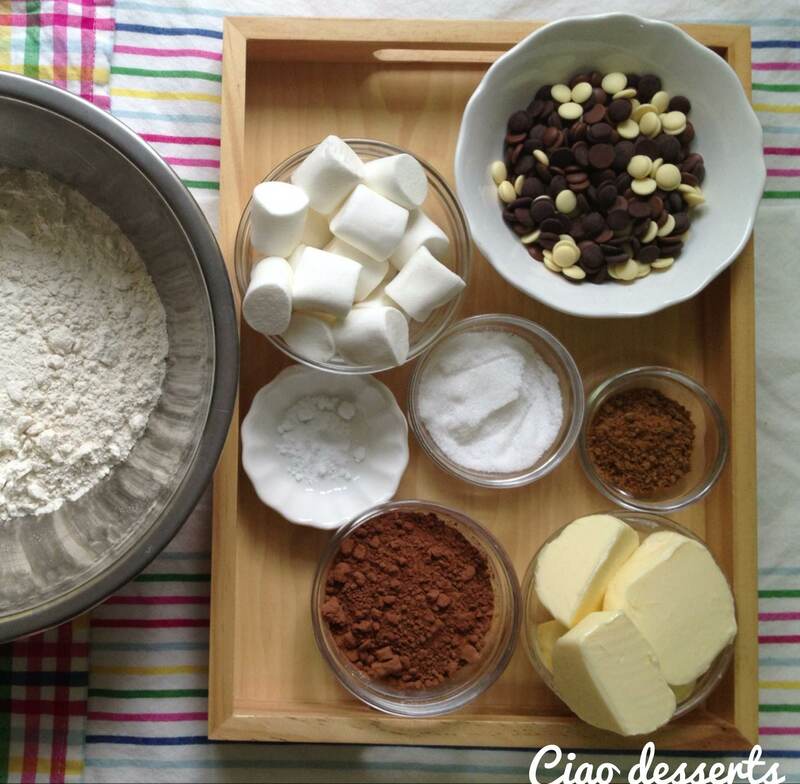 Wrap the dough around the marshmallows, completely encasing them and forming a 2-inch diameter ball. Place balls on ungreased baking sheets, 2 inches apart. Cool on pan 2 minutes, then transfer to a cool flat surface. 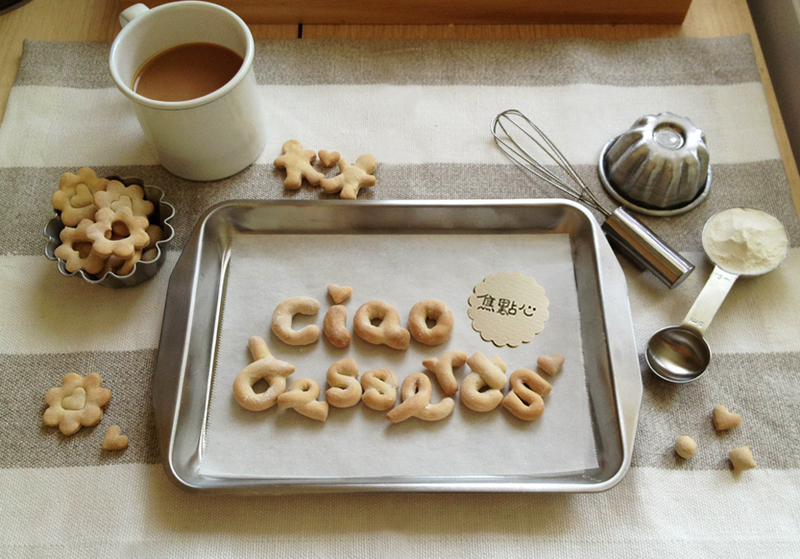 These cookies go well with a glass of milk or cup of coffee. Enjoy! I’m going to try your bimimbap recipe this weekend!